We invite our registered users to submit comments, information, photos, and other materials in designated portions of Loyalty 360’s website. It is our hope that you'll take the opportunity to contribute to these interactive forums and help make our Site more useful as a reference resource for you and other participants. To protect the website from misuse and to keep our interactive forums enjoyable and interesting for all of our users, you will be required to follow the rules outlined below. You agree that Loyalty 360 is not responsible for any user submitted content. You understand that we have the right, but not the obligation, to monitor and screen content submitted by users of our Site and to edit, move, delete and/or refuse to accept any content that in our judgment violates our User Agreement (including these rules) or is otherwise unacceptable or inappropriate, whether for legal or other reasons. We further reserve the right, in our sole discretion, to remove a user's privilege to post content on our Site. You agree that you are fully responsible for the content that you submit. You will be solely responsible for any and all content and materials of whatever nature that you post on, transmit or link to from the Site. You will promptly remove any content that you have posted should you discover that it violates these rules or that it is otherwise inappropriate. You agree to indemnify and hold harmless Loyalty 360 and its subsidiaries and affiliates, and each of their respective directors, officers, managers, employees, shareholders, agents, parent corporation, affiliates, subsidiaries and their individual representatives and licensors (“Loyalty 360 Indemnitees”) from and against any and all losses, expenses, damages and costs, including reasonable attorneys’ fees resulting from any claim brought by any third party relating to content or materials submitted to or displayed on the Site by you or by others using your account. You certify that you have the permission of others who have contributed to or are featured in any content that you submit. You must obtain the prior written permission of any individual that is represented in any photo, video or other content. If there are any individuals under the age of 18 in any photos, video, or other content that you submit, you must obtain the permission of each such individual's parent or legal guardian prior to submitting the content. You certify that you are at least 16 years of age. If you are under the age of 16, please do not submit any content to us. If you are under the age of 18 but at least 16 years of age, you may submit content only with the permission of, and under the written supervision of, a parent or legal guardian. If you are a parent or legal guardian agreeing to these rules for the benefit of an individual between the ages of 16 and 18, please be advised that you are fully responsible for his or her submissions and any legal liability that he or she may incur. You acknowledge and agree that any use and/or reliance by you on any information obtained through our Site is at your own risk. Despite our efforts to moderate the Site, inaccurate content submitted by users may make its way onto the Site. While our goal is to provide you a wealth of useful information, we cannot vouch for the accuracy of content submitted by users. You specifically agree that you will not hold the Loyalty 360 Indemnitees liable for any losses or damages that you may incur by using or relying upon any information contained on the Site. You agree that you are using the information at your own risk. For any content that you submit, you give us permission to use such content. You represent that any content or materials you submit to Loyalty 360 that you have all rights necessary to provide such content or materials to us, and you grant us a royalty-free, irrevocable, perpetual, worldwide, exclusive, and fully sublicensable license to use, reproduce, modify, adapt, publish, translate, create derivative works from, incorporate into other works, distribute, perform, display, and otherwise exploit such content or materials, in whole or in part in any form, media or technology now known or later developed. You agree that we, including our partners, agents, representatives and service providers, may identify you as the author of any of your postings by username as we deem appropriate. You will not receive any compensation of any kind for any content or materials submitted by you. 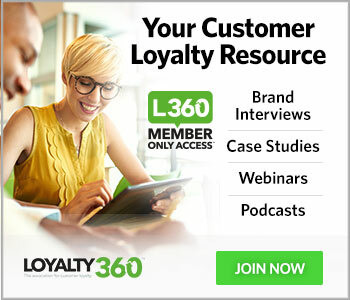 You acknowledge and agree that Loyalty 360 may preserve content and materials submitted by you. You further acknowledge and agree that Loyalty 360 may disclose such content and materials if required to do so by law or if, in our business judgment, such preservation or disclosure is reasonably necessary to: (a) comply with legal process; (b) enforce the terms of our User Agreement; (c) respond to claims that any content or materials submitted by you violate the rights of third parties; or (d) protect the rights, property, or personal safety of our Site, our officers, directors, affiliates, staff, representatives, or members or other users, and/or the public. You acknowledge that you have read and agree to abide by our User Agreement.